We headed out of town for Innsbruck but the GPS system was set for shortest route which was slow and through the Alps on non-freeways, so I changed it to fastest route and we had to backtrack and lost 30 minutes. Marcia drove the 115 miles to Innsbruck in 2 hours but she almost fell asleep. I had my favorite goulash at Goldenes Dachl but forgot to get the goulash as a soup, but it was good. I took over the driving and crossed the Brenner Pass in a driving rain and got into Italy and the sun finally came out. 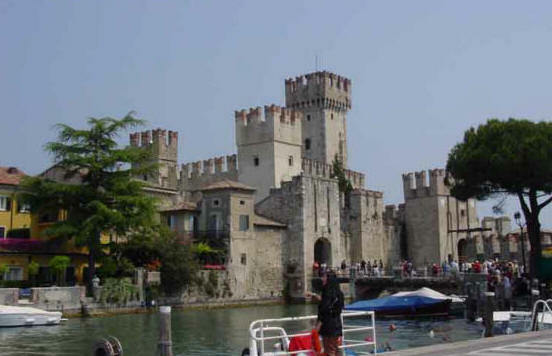 After about 90 miles (1.5 hours), I was falling asleep so we pulled over and Marcia drove the remaining half into Sirmione. Our usual Hotel Sirmione was full on such short notice but we got a suite at the Hotel Flaminia nearby (€160) since it was our anniversary. 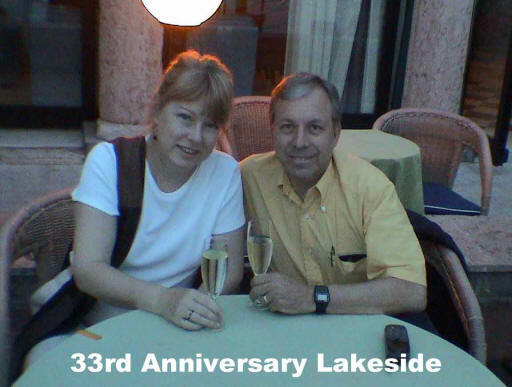 We enjoyed two glasses of Prosecco (Italian Champaign) on the deck overlooking Lago di Garda and then went to dinner at Café La Roccia for the first time. It was great eating real Italian food again. A bottle of local vino bianco, pizza margherita, prosciutto e melone, spaghetti vongole (clams) and branzino (Italian sea bass) and we were in heaven. On the walk back a lemone gelato and a glass of limoncello. Finally the wedding anniversary I wanted to share. We wanted to be with Dimitrii and Tania but it wasn’t in the cards. He was in Israel lecturing and would not be in Milano until Saturday night. I woke at 4:30 AM but fell asleep again this time. Woke again at 6:00 and thought about running before it got too hot, since we had to check out but fell asleep again to wake at 9:15. The hotel gal calls and tells me they had a cancellation, so we can stay another night. I called Dimitrii and since he would not get back from a live surgery course in Palermo, Sicily until 5 PM, we should do what we want. So we decided to stay and relax. We later found out that because of a strike, he was stuck at Palermo airport until very late, so it was good that we stayed. I finally got to run at 11 AM along the strand of the Lago di Garda with hot sun but nice cool breeze. The strand is 1/3 mile long so three trips makes a mile. Up to now I have had zero interest in writing any diario, but with the time to relax I decided to sit down and get to it. So I went to my favorite café, Café Gino near the hotel for a cappuccino and my computer. Did some shopping and bought a signed print from a local artist which shows the famous castle. After lounging around and relaxing at the shore of the lake I decided to go to Mass on Saturday, since we had to leave early in the morning. Santa Maria Maggiore is a very nice little church and attended a baptism at the same time. For dinner we returned to Ristorante Pace which we had been before for pizza and vino. We then tried a new place, Trattoria La Fiasca for primi and secondi. It was very good. We got to bed at a decent hour after having a coconut and pineapple gelato. I woke up at 6 AM and repeated my run along the lake to Villa Pioppi at 8 AM. I had a cappuccino at the Cafe Gino and then returned to the hotel and did something unusual for me. I ate a very big breakfast that was very good. It was free, so why not? I did my photos and we checked out of the hotel at 11:30 and crossed the bridge just before it closed down at noon. Marcia drove the 90 miles to Arese (west of Milano) in less than two hours. Dimitrii gave us a tour of his new house which was quite spectacular. I got do email using AOL Anywhere which has been very much upgraded. It is much quicker than two years ago and is probably the only way I will get email. I became Dimitrii’s daughter Anastasia’s godfather (padrino) in 1999, so I went to the church with them for her first Confession. She greeted me with great enthusiasm, jumping up on me and giving me a big kiss. 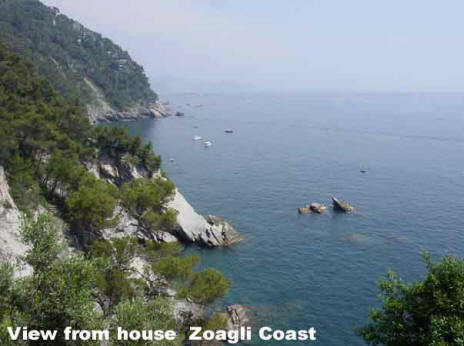 At 5:30 we drove directly south toward Genova and then east to the little beach town of Zoagli [Zoh-ah-lay] where Dima has a home on the cliffs overlooking the Ligurian Sea. 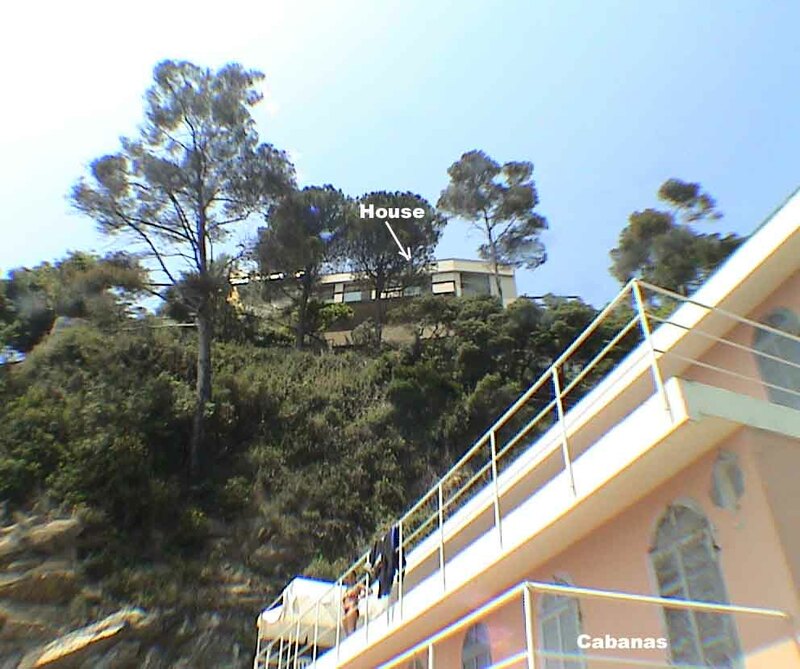 It was a crooked road up to this mansion clinging to the Ligurian cliff. It took us an hour to explore the house. We found our room and unpacked our bags. The views are spectacular - a little Paridisio. Afterward we went to dinner with Dan and Rosella who run the Clinic where Dima works in Casale Monferrato. We ate at Ristorante Aquasalata [Piazza XXVII Dicembre 9, +39-018-525-0060] and it was good pesce (fish). Got to bed at 2:30 AM (getting back to normal life).